Like Coleco, Tandy started as a leather company. Founded in 1919 under the name Hinckley-Tandy Leather Company. Tandy started to expand and acquired American Handicrafts Company in the ’50s, adding hobbyist-related product to their leather stores. By 1962, they bought Radio Shack which was near bankruptcy at the time. By the mid 70s it was clear for Tandy that the computer and the video game industries were here to stay and decided to invest heavily in them. In 1977, Tandy releases the TRS-80 computer under the Radio-Shack brand as well as the TV Scoreboard. Aside from the Tandyvision One in 1982 which was a rebranding of the Intellivision, Tandy stayed out of the video game business for almost a decade, but in 1989, Tandy started working with Microsoft on a new CD-based console code named Gryphon. The goal :fill a gap between video games and personal computers. The work on the Gryphon was primarily done by Frank Durda. Frank overseed the hardware design, the driver’s creation, etc. Frank was helped by Paul T Schreiber how designed both the video and audio card for the Gryphon while overseeing the creation of the infrared received card by a third engineer. For the occasion, Microsoft developed a new version of Windows called Windows Modular (code named Haiku). Based on Windows 3.1, the OS would ensure that developers could easily port existing games from Windows 3.1 to the VIS in a matter of weeks. 150 were planned for the original roll-out , but only around 80 titles were ready at launch. 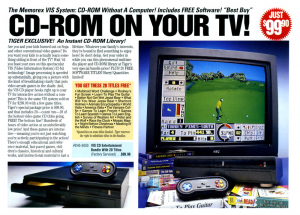 By comparison, CD-I had 50 after two years in production. Tandy also partnered with Zenith that would provide support for the console. They also had a deal to realize the console under their own brand as they were examining the VIS system as part of a delivery mechanism for large-format television. Tandy claims that its built-in sales channels, including more than 5,000 Radio Shack stores and the thousands of Tandy Name Brand retail chains, would place VIS boxes within 10 minutes of 90 percent of the U.S. population. Tandy put VIS kiosks in the front of the store, and equip them with demonstration discs that show off a wide range of titles to get consumers ‘hooked’ on the technology. With 35,000 consoles ready to be sold, Tandy was ready to enter the videogame console ring once again. As the VIS project approached completion, Microsoft realized that their minimum system hardware platform for Modular Windows made its bloat far too slow for consumer acceptance for just about any application so Microsoft bumped the minimum from 12MHz 286 to 16MHz 386SX and doubled the RAM and ROM requirements to 2Meg each, which effectively doubled the hardware cost for the processor and associated components at that point in time. However, Microsoft raising of the minimum requirements for Modular Windows came in August/September of 1992, far too late to change the initial VIS hardware platform. Some of the gate array semiconductors were already in fabrication at that point and all the parts for the machines were already arriving. Tandy decided to stay the course and start working on a VIS-2 that would meet these requirements. The Visual Information System (VIS) finally release in November 1992 under the Memorex brand (a brand that belongs to Tandy). It was sold exclusively in the Radio Shack and Tandy store and retailed for $699 USD. Although the price point was fairly high, it was still cheaper than the t Philips CD-i which sold for about $1,000 USD. Tandy tried to boost the sell by announcing that 20,000 units had shipped. It was technically true as all store they own would received at least 2 units, one for demonstration purpose and one for sell. Sadly, this announce was not able to convince anyone as only 255 VIS systems were sold during the Holiday of 1992. To add insult to the injury, the January sales of the VIS system were negative, as some of those 255 came back. 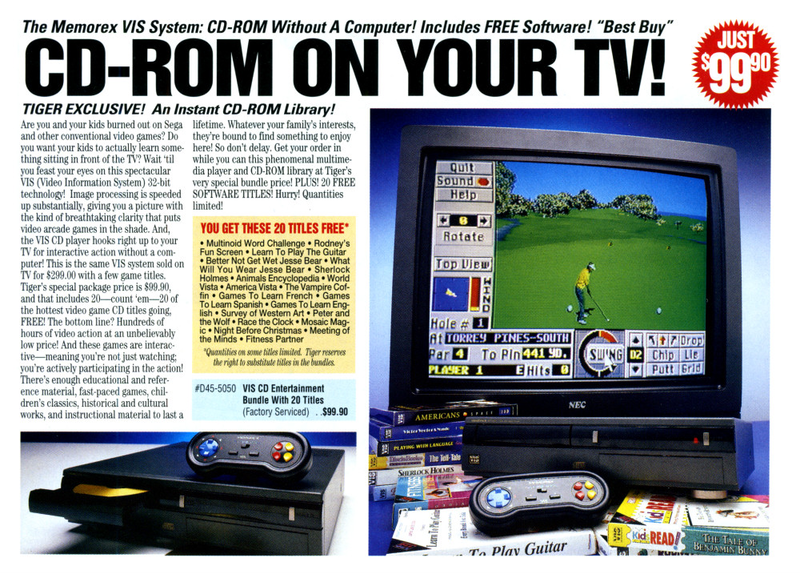 Although an interesting concept, the VIS was already outdated by the time of its release. 486 processor were introduced in 1989 and the Pentium processor was just around the corner. With nearly three generations behind, the VIS failed to entice any computer enthusiast. 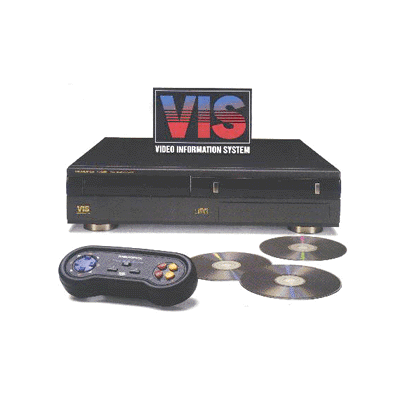 Like the CD-i, the VIS was marketed as an edutainment system and just like the CD-i, it failed at delivering a decent experience. Educational software were not at their best while displayed on a television and the lack of action-paced title made drove away any potential gamer. Radio Shack were unable to sell the first production batch of the VIS and the console was stuck with about 50,000 devices. With the sales going nowhere, they had to liquidate them through their way to fire-sale venues such as Home Shopping Club where the VIS was sold as the Memorex MD 2500 Video Information System for $399. In the end, the system was sold for 99$ bundled with 20 titles. Shortly thereafter, Microsoft publicly denied that Modular Windows was ever a product, claiming it was just a “Concept” and drop the development of the Windows Modular. In January 1993, all work on the VIS-II system was cancelled, and many of the people working on the project were let go. Tandy lost $75 million on VIS, as of July 1st 1993. One of the major problems was the underlying Windows architecture. For example, when Windows 3.x starts, it opens, reads and closes the SYSTEM.INI file 75 separate times. The big improvement between Windows 3.0 and 3.1 was the addition of SMARTDRV, which cached SYSTEM.INI and WIN.INI to the exclusion of all else just to make these reread go faster. Now, if you put SYSTEM.INI on a CD-ROM, and you have no hardware cache in the drive and no SMARTDRV buffering, things get real slow. This problem prevented popular title to be ported to Windows Modular. For example, in the port of Kings Quest V to Windows Modular, it took exactly five minutes from the disc insertion until the point here the game asked “Have you played this game before?”. The lack of the Windows blockbuster of the time such as Space Quest IV, King Quest V and Lemmings put the final nail in the already very shut VIS coffin. While VIS applications run on Windows 3.1, the result will be unexpected as there’s usually no way to modify the control scheme for theses applications. Simple application that requires only one button might already work (especially DOS based application) with mouse instead of the controller while others will not be mapped correctly or will not even load. CPU: 12 MHz 80286 AMD (N80L286-12/S) on a local bus (not ISA) running at 12MHz. 0-wait states. Equivalent PC performance somewhere around that of a 386SX-16 or 20. Meg ROM containing minimal MS-DOS 3.x, a few drivers, and the fabled Modular Windows(TM). 1 Meg of RAM in a conventional PC layout 640K + 384K. Mitsumi 150K/sec CD-ROM drive with 16-bit interface, 800msec access, 1300msec worst case access , CD+G capable, but not Photo-CD. 5000 hour MTBF. IR interface with up to two IR transmitters (hand controllers) operating at once. PS/2 mouse or keyboard interface (either can be connected and are generally recognized by applications). A wired hand controller could also be connected to this port for use in locations where the wireless controller was not practical, or could be used in conjunction with one wireless controller. Outputs: RCA Line left/right, composite video, RF video, S-Video. NTSC video. Dallas Semiconductor plug-in CyberCard – removable non-volatile storage, in sizes up to 512K (big bucks for 512K size) and system comes with 32k unit. Onboard audio is same as Tandy Sensation I: Adlib Gold compatible, not Sound Blaster compatible. Video uses ADAC-1 chip as found in Tandy Sensation I, supports YUV and several high-quality color modes. Also supported some TV-specific features for handling overscan. The same modem card that went in the Tandy Sensation could also be installed in the VIS. 2400 data 4800 send-only FAX. RS-232 serial board for debug purpose. They were sold 500$. Software released for the VIS had an initial order of 6,000 copies. This number could go up to 10,000 if Tandy were particularly enthusiast about a specific title. Most information comes directly from Frank Durda IV, Senior Project Software Engineer for Tandy how work on the VIS.